The Defence Secretary has announced that, from December, civil servants in central government departments who volunteer as reservists will receive a minimum of 10 days' special paid leave per year to conduct their military training. Following direction from the Prime Minister that the Government should lead the way as an employer of Reserves, the Head of the Civil Service has agreed with Departments to introduce a policy providing a standard minimum of 10 days’ special paid leave for Reserves training across central government departments. This will allow reservists to undertake their mandated annual period of continuous training without needing to sacrifice their annual leave entitlement. In the future the Reserves will form an integral and integrated part of the Future Force so we will need greater assurance that reservists will be available when needed and trained to the necessary levels. To achieve this we will need a closer, more mutually supportive relationship between employers and Defence. Central government departments have also committed to demonstrate visible leadership through promotion of the benefits of Reserve Service for both employers and reservists and to introduce enhanced guidance for line managers to be able to deliver this. The new policy will create a standard minimum offer for special paid leave to be used for Reserves training. It will be applicable to civil servants in central government departments who are reservists and will enable them to attend the annual period of mandated continuous training. This policy details a minimum of 10 days, but Departments will not be restricted should they wish to grant more. The introduction of a standard minimum amount of special paid leave for Reserves training represents a concrete commitment by the Government to lead the way as an employer of Reserves. Civil Service reservists in central government departments will benefit from this policy from December 2012. 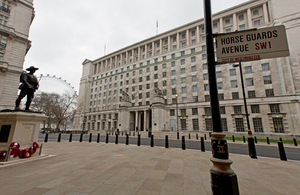 Following the publication of the forthcoming Green Paper on Future Reserves 2020, the Ministry of Defence will begin a formal period of public consultation on the measures to achieve our vision for the Reserves.